When the weather gets warmer, I find myself craving cool breakfasts. A steaming hot bowl of oatmeal just doesn’t appeal to me when I’m already sweating at 8 am. And who wants to heat up the kitchen cooking up anything anyways? My go to quick breakfast is usually a smoothie, but sometimes I want something a little more substantial – a meal I need to eat with utensils rather than drink on the go. 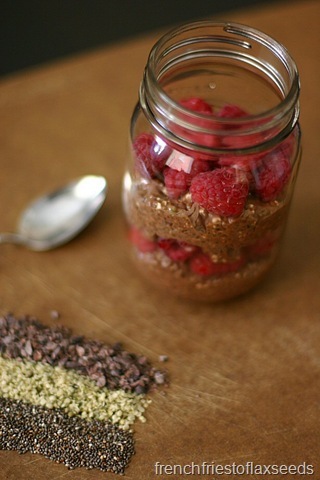 Enter the chia breakfast parfait! Something about transforming your breakfast into a layered parfait makes it seem so much more…fancy? Dessert like? Whatever it is, it’s definitely more fun to eat than a bowl full of granola, that’s for sure. 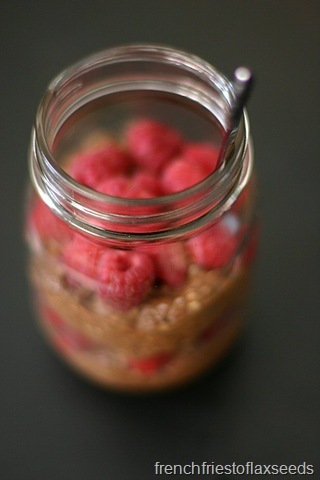 And chia seeds lend themselves really well to making a breakfast parfait. Once they soak in some liquid for awhile, they take on this great thick pudding like texture. Much nicer, in my opinion anyways, than oats soaked overnight, and quicker – they only take 20 minutes! I decide to amp up both the flavour and nutrition in my chia breakfast parfait by adding hemp seeds, cacao nibs, cocoa powder, and maca powder. The hemp seeds add more protein, fibre, and omega fatty acids, while the cacao nibs and cocoa powder boost the antioxidants and of course flavour. Maca is another South American plant that is supposed to help with energy and hormone balance, and it also has a bit of a caramel flavour. 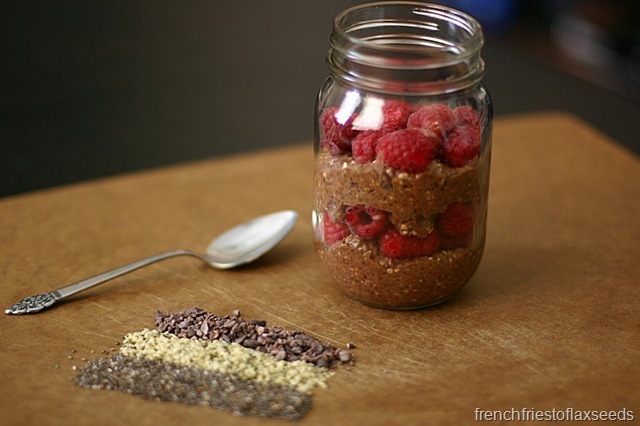 A little maca powder goes a long way – you can easily overwhelm your parfait if you add too much. Of course, my parfait needed some colour and fruity goodness, so I added these beautiful local BC raspberries – my absolute favourite local fruit. I swear, I could eat through pints of these gems if given the opportunity. They are tart yet sweet, and high in fibre and vitamin C. And they just happen to pair with chocolate amazingly. With chia seeds, hemp seeds, cacao nibs, and maca powder, this raw, gluten-free breakfast parfait is a nutritional powerhouse. Not only does it taste great paired with ripe local raspberries, but it will keep you going all morning as you enjoy the summer heat. Make it the night before for a quick grab and go breakfast. 1. Combine chia seeds, hemp seeds, cacao nibs, cocoa powder, maca, almond milk, vanilla, and maple syrup (if using) in a bowl. Allow to sit for 20 minutes for chia to absorb all of the liquid. 2. 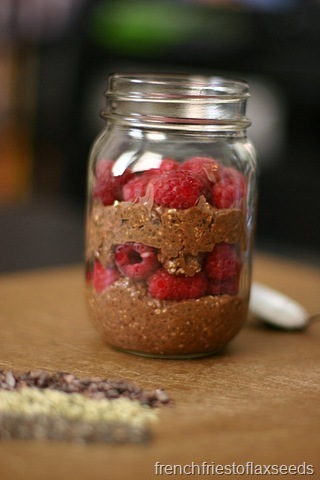 In a parfait glass or other dish of your choosing, alternate layers of chia pudding and raspberries. You can always just top the pudding with raspberries in the bowl and eat it that way as well, it’s just not as fun! Note: If raspberries aren’t your thing, or not available, substitute your favourite berry – blueberries or strawberries would be great as well. #16 – which I have determined belongs to Bronwyn! Congrats Bronwyn! Email me at marianne@frenchfriestoflaxseeds.com with your mailing information, and I will send off your prize. Thanks again to all who entered – I’m so glad to see how many people want to get their sprout on! Definitely printing, and making this recipe! I don’t do cocao nibs (I’m cheap and they are not cheap! )….so I may need to find a replacement. This sounds amazing. You could probably use nuts on seeds (pumpkin, sunflower) instead. 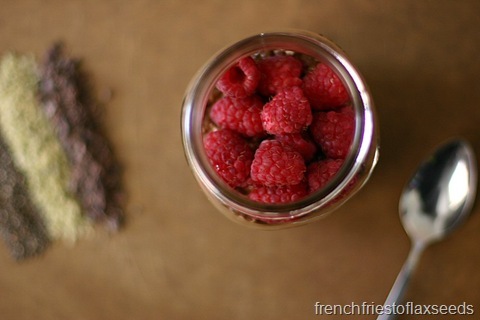 I haven’t found cacao nibs to be that pricey – a little goes a long way. Seriously…I think I am in love! I work at 6am 2 days a week and today instead of buying breakfast this morning I brought all my smoothie ingredients to work..and made it here. A bit annoying! But this would be perfect to throw together the night before.